Author Archives: N.C.S. TRADE HUNGARY Kft. Commercial Registration: For commercial use. 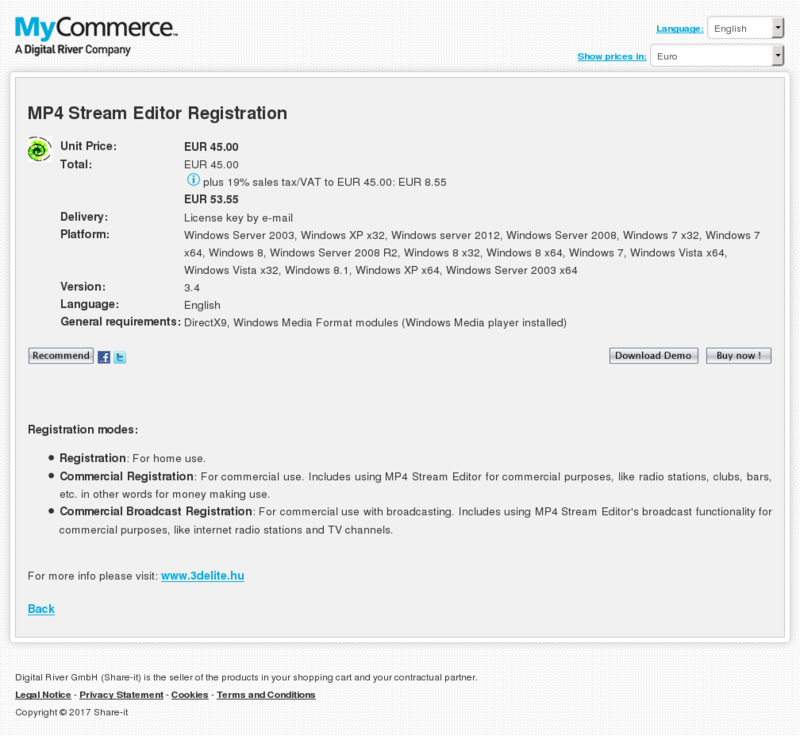 Includes using MP4 Stream Editor for commercial purposes, like radio stations, clubs, bars, etc. in other words for money making use. 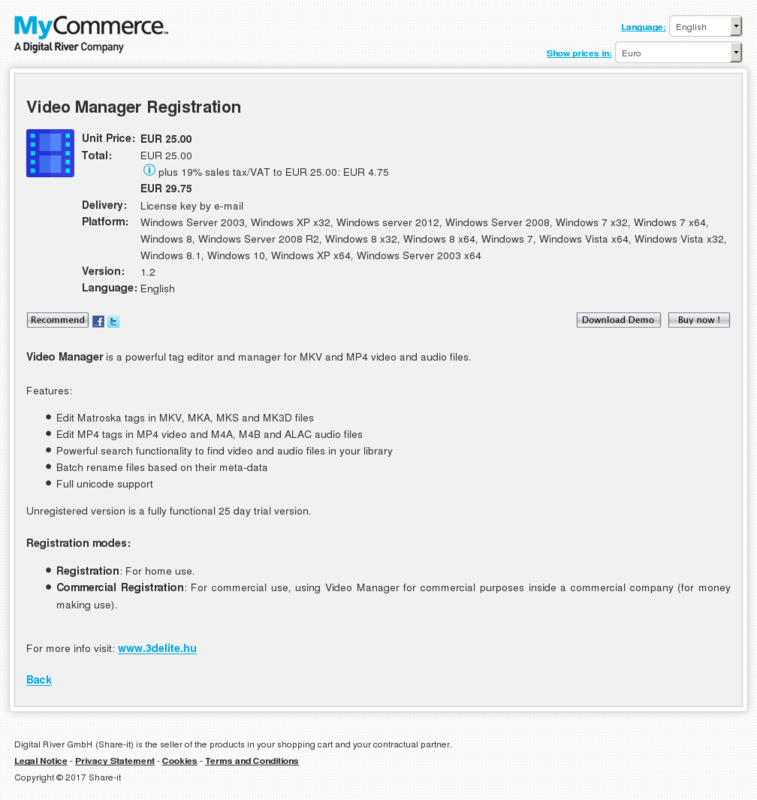 Commercial Broadcast Registration: For commercial use with broadcasting. Includes using MP4 Stream Editor’s broadcast functionality for commercial purposes, like internet radio stations and TV channels. 3delite’s VSTi Synth is a modular VST synthesizer instrument plugin in Win32 and Win64 version. Link virtually unlimited oscillator and audio file sources through DSPs and mixers to generate various voices. Audio clip as an "oscillator"
Unregistered version is a fully functional 25 day trial version. After the evaluation period changing the parameters is disabled but it’s still possible to use the plugin as a player. Commercial Registration: For commercial use, using 3delite’s VSTi Synth Plugin for commercial purposes inside a commercial company (for money making use). 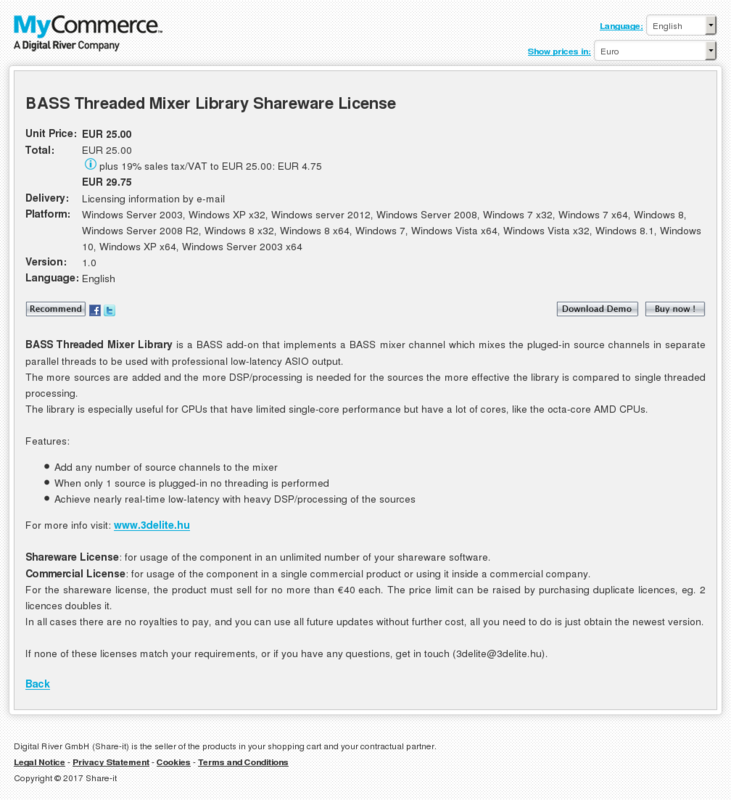 BASS Threaded Mixer Library is a BASS add-on that implements a BASS mixer channel which mixes the pluged-in source channels in separate parallel threads to be used with professional low-latency ASIO output. 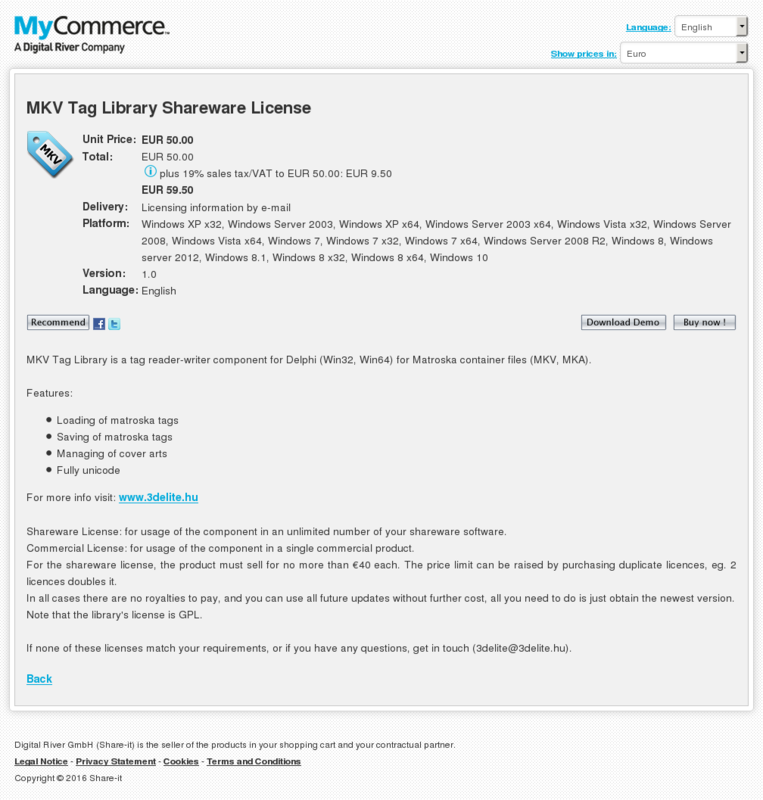 Shareware License: for usage of the component in an unlimited number of your shareware software. Commercial License: for usage of the component in a single commercial product or using it inside a commercial company. For the shareware license, the product must sell for no more than €40 each. The price limit can be raised by purchasing duplicate licences, eg. 2 licences doubles it. In all cases there are no royalties to pay, and you can use all future updates without further cost, all you need to do is just obtain the newest version. If none of these licenses match your requirements, or if you have any questions, get in touch ([email protected]). DS WASAPI ASIO Router Mixer is an audio input to audio output router/mixer with support of Direct Sound, WASAPI and ASIO modes. Any type and number of audio inputs can be routed to any type of audio output with matrix mixing, VST DSP plugin support, 11 band equalizer and recording option. Equalizer and matrix mixing has a preset system to store and recall settings. DS WASAPI ASIO Router Mixer can start automaticaly with Windows with last used settings. 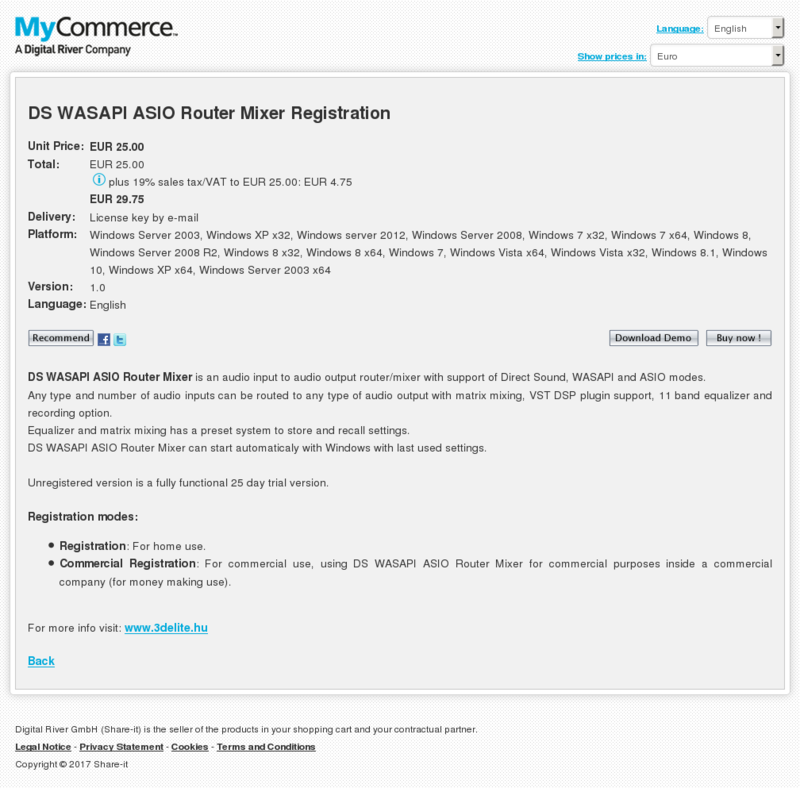 Commercial Registration: For commercial use, using DS WASAPI ASIO Router Mixer for commercial purposes inside a commercial company (for money making use). 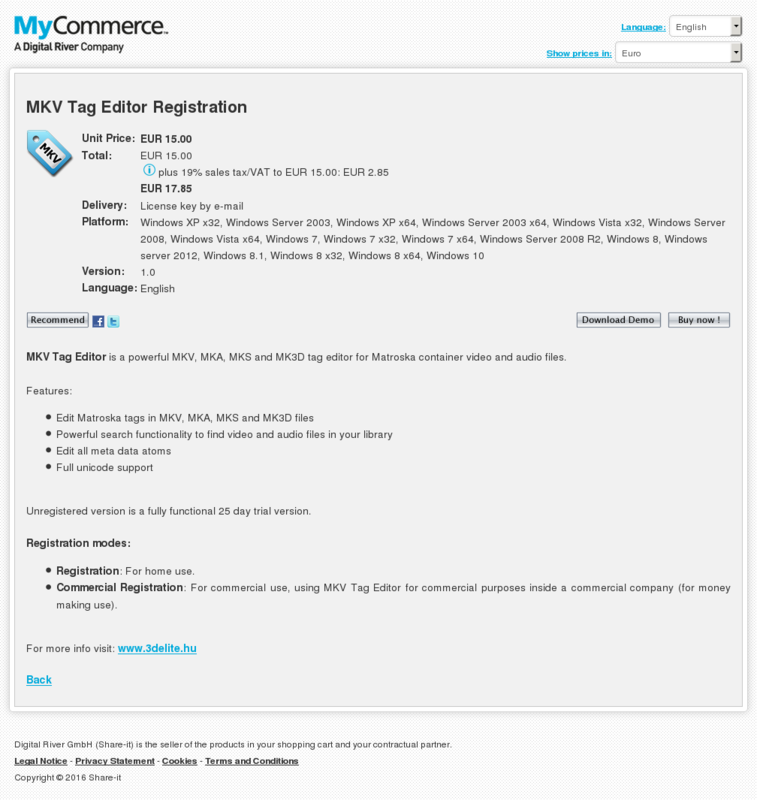 MKV Tag Library is a tag reader-writer component for Delphi (Win32, Win64) for Matroska container files (MKV, MKA). Commercial License: for usage of the component in a single commercial product. Note that the library’s license is GPL. Commercial Registration: For commercial use. Includes using MP3 Stream Editor for commercial purposes, like radio stations, clubs, bars, etc. in other words for money making use. 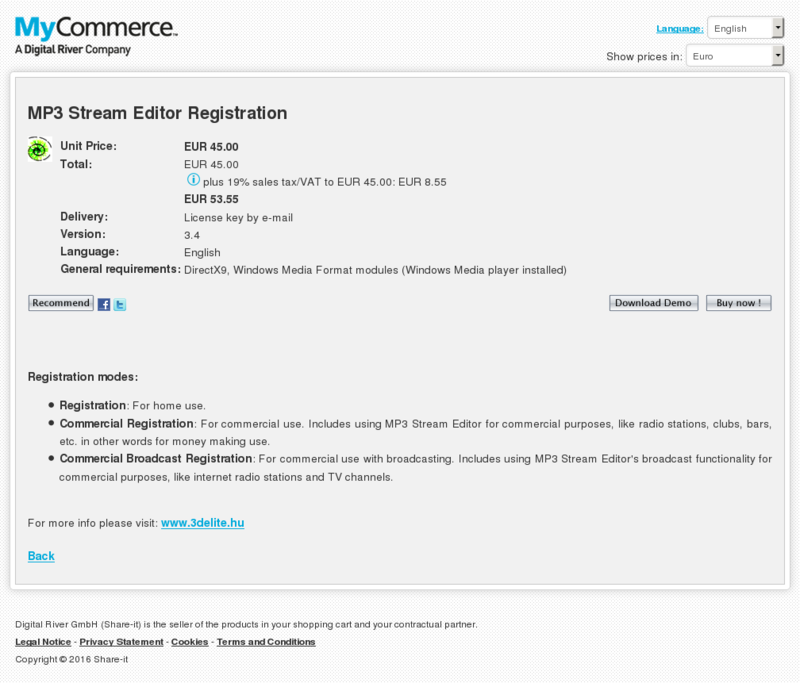 Commercial Broadcast Registration: For commercial use with broadcasting. Includes using MP3 Stream Editor’s broadcast functionality for commercial purposes, like internet radio stations and TV channels. This plugin is an audio file format plugin based on the BASS sound system for Directory Opus with audio file thumbnail viewer (the same as in Filesystem Dialogs) and TSampleDisplay3D. E-mail Tray Notification checks incoming e-mails in specified intervals and notifies the user if e-mail(s) that meet the specified criteria arrives. 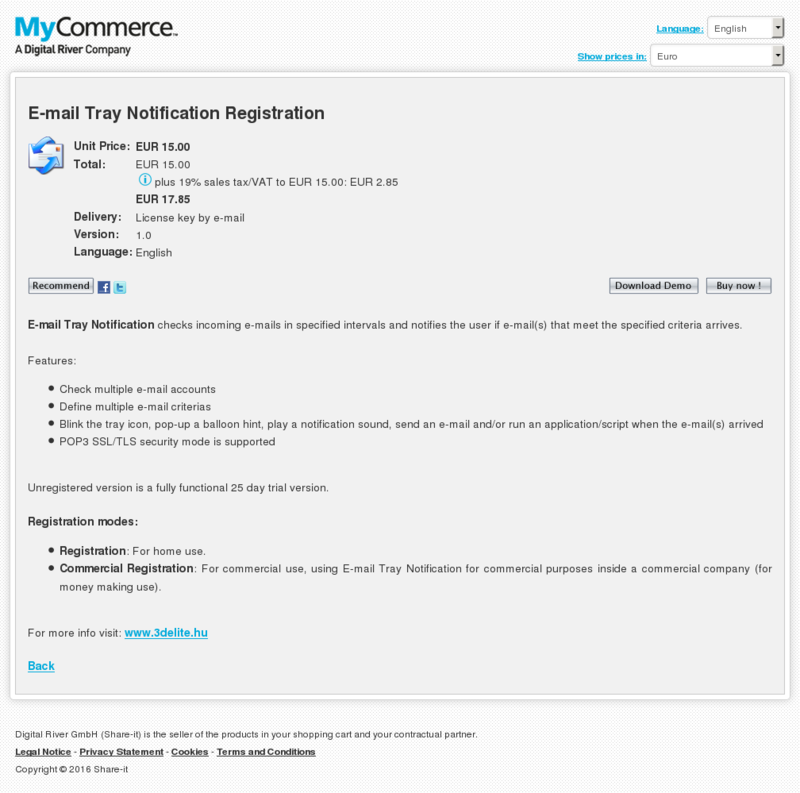 Commercial Registration: For commercial use, using E-mail Tray Notification for commercial purposes inside a commercial company (for money making use).